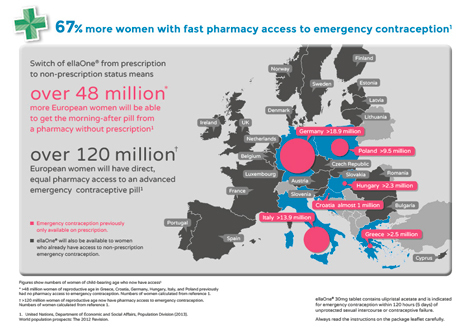 Wordbird is delighted to be working with HRA Pharma on their OTC launch of the emergency contraceptive pill, ellaOne® only the fourth ever centralised EMA reclassification from POM-P.
As part of the reclassification, Wordbird has worked with HRA Pharma to create a range of compelling communications, including core pharmacy education, women’s education, infographics and website content. In addition, Wordbird has provided consultancy in responding to CHMP questions during the reclassification process. Wordbird is also thrilled to announce that its PAGB associate membership has been accepted following its work with HRA Pharma UK and Ireland. This paves the way for Wordbird to further expand its OTC client base in 2015. For more information please contact Sarah Sowerby on 0207 622 5236 or sarah.s@wordybirdy.co.uk.